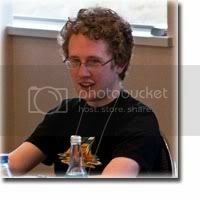 July 11, 2011 : Interview with Speedsolving.com member Tim Reynolds : Currently (at the time of this interview) has attended 51 official WCA competitions, organizing many of them, including US Nationals 2010 at MIT (Cambridge, MA). He is the former Continental Record holder (North America) for 3x3 fewest moves (31 in 2008), and Pyraminx Single (7.22 in 2008) / Average (8.85 in 2008). Location: Cambridge, MA during the school year; Pleasantville, NY during the summer. 3x3 fewest moves. My background academically is mostly mathematics, and this has the most direct cube theory applications of any event in my opinion. Unlike most events, which are the same thing over and over, fewest moves feels like a new experience every time, and leaves opportunities for a lot of creativity. It's also the only event you can decide not to try the scramble they give you--you can do the inverse instead! Back in 2003, I went to a summer camp and Andy Camann was there as well. This was shortly before WC2003, so the world record was 22.95 still. During the talent show, Andy solved it in about 18 seconds, which was pretty cool. I tend to get pretty competitive about things, and so once I learned to solve the cube I just wanted to get faster and faster. Plus, solving Rubik's Cubes is a geek stereotype, so that was a reason to practice. My successes in big cubes blindfolded, particularly 5x5. In 2008, for the 2 weeks before I went to college, I did 2-3 attempts at 5x5 per day. I never got one. I estimate that I had done about 60 attempts before my first success in December 2010. The time was 28 minutes, which was faster than my first 3x3 success (32 minutes)--I guess that's a claim to fame. My second success was about a month later, at UIUC Spring 2011, which was awesome even if the solve itself was disappointing. I still haven't gotten a third success. So my 5x5 BLD accuracy rate is certainly no great accomplishment, but getting one at all felt great. I'm a casual runner, but as I said I get pretty competitive about things, so I decided to run a marathon. Unfortunately I hurt my knee 2 months before the race, but I'll run one sometime soon, I hope. I used to say that computer programming was a hobby, but it's turned into more of a career path than a hobby. I guess it still counts as a hobby. These come and go, but one that I noticed today was when people use too many ellipses in emails. If we continue to grow, I imagine there will develop a hierarchy of competitions. Worlds will have very hard qualification times, while more local competitions will have easier cutoffs. In order for us to continue to grow, though, we need to become more well-known: most people still have no idea we have frequent competitions. News coverage of competitions will help this tremendously. It's not as much the competitions but the time hanging out with cubers before or after the competitions that I love. This is when people are not doing last-minute practicing and trying to decide whether another drop of Maru Lube would help, but just hanging out, doing stupid relays, talking about the cube community, or other things like that. US Nationals 2009 stands out in this respect, as do Worlds 2007 and 2009, Toronto Fall 2010, and cubeCentric 2011.